Rides, Games, Food, Free Nightly Entertainment, Bingo and much, much more for the entire family. **Please Note** No Unauthorized Vending, Soliciting, Peddling or Concession Sales Allowed On Braidwood Park District Grounds During The Festival. All Vendors, Solicitors, Peddlers or Concession Vendors Must Be Registered And Approved By The Braidwood Lions Club. Any Unauthorized Vendors, Solicitors, Peddlers or Concessioners Will Be Asked To Leave Park Grounds. For safety reasons, no pets will be allowed on festival grounds in the carnival midway area, food court, entertainment areas, flea market areas, parking lots or baseball field areas, regardless of size, temperament, or leash. Only certified ADA service animals will be permitted. Anyone found walking about the festival grounds will be asked to take their pets back home. Join us on Facebook to get even more updates and information on Summerfest!! Each night during the festival live musical entertainment takes place on the Exelon Generation Entertainment Stage. Bands from around the area perform a wide variety of styles and hits. Check back often in the months prior to the festival to see what live entertainment will be playing. **NOTE** We are not seeking any promotional items or entertainment proposals for our 2019 festival as all of our live musical entertainment needs have already been filled. "Ethan Bell Band" 7:30pm - 11:30pm BACK BY POPULAR DEMAND!! "Silverstrings" 6:30pm - 9:30pm BACK BY POPULAR DEMAND!! **Buy a wristband on Sunday from the carnival midway ticket booth and chance to win one of two bikes. The carnival midway is provided by A&A Attractions. Click here for A&A Attractions' web site. Thursday 7/18: 6:00pm. to 11:00pm. Friday 7/19: 6:00pm. to 11:00pm. Sunday 7/21: 2:00pm. to 10:30pm. - Purchase an unlimited rides wristband from the carnival midway ticket booth on Sunday 7/21 and receive a chance to win one of two bicycles. Winners must be present to win. Drawing will be held at 6:30pm. at the midway ticket booth. Bicycles provided courtesy of A&A Attractions. Saturday July 20 and Sunday July 21 from 9am to 5pm. 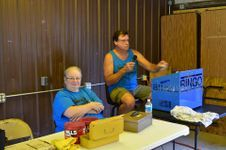 The flea market is located at the south end of the Braidwood City Park (First & Center St.) For more information about the flea market please call Flea Market Coordinator Andy Kaminsky at (779)233-1026. Click on the link below to view & print an official 2019 Summerfest Flea Market, Arts & Crafts Show vendor application form. Hometown Proud Parade Sunday (7/21) 1:00p.m. The annual Hometown Proud Parade will take place on Sunday July 21st starting at 1:00pm on Braidwood's Main Street. Line up will begin at 12:30 on Mitchell St. next to Casey's. The parade will begin at Main & Mitchell Street, travel down the Main Street to Walker Street, turning south on Walker Street and ending on Walker Street behind the Reed Custer Intermediate School. For more information on the Hometown Proud Parade please call Parade Coordinator Jim Canup at (815)458-2642. Click on the link below to view & print an official 2019 Summerfest Hometown Proud Parade Entry Form. Baby Contest Saturday (7/20) 10:00a.m. The annual Summerfest baby contest coordinated by The Braidwood Area Healthy Community Coalition will take place on Saturday (7/20) at the main entertainment stage starting promptly at 10:00a.m. For more information, please call Pam at (815)712-7767 and leave a message for a return phone call. Check back in the months prior to the festival to find an official Summerfest Baby Contest Entry Form. Pie Eating Contest Saturday (7/20) 1:00p.m. The Annual Summerfest Pie Eating Contest will take place on Saturday (7/20) under the hospitality tent next to the Bingo pavilion starting at 1:00p.m. With several age categories, both young and old can showcase their pie eating talents without the use of their hands or utensils. Walk up registration on the day of the contest will be accepted on a first come, first serve basis starting at 12:30pm. There will be no pre-registration. Check back in the months prior to the festival to find an official 2019 Summerfest Fast Pitch Baseball/Softball Team Registration Form. For more information please call BBSA Board President Jerry Curl at (815)701-3494 or email BBSA2014@yahoo.com. Fireworks Display Sunday (7/21) @ 9:30p.m. Be sure to grab your lawn chairs or blankets and come on down to the park for the grand finale. The annual Braidwood Lions Club Summerfest fireworks display will bring the festival to a close with a bang on Sunday night (7/21) starting at 9:30pm. Always a crowd pleaser, the annual fireworks display is sure to amaze you as you get a close up seat to all the action. The fireworks display is provided by Mad Bombers Fireworks Productions. 10 food vendors make up the food court which is located just off the entertainment area. A wide variety of choices are available to fit every taste. American, Italian, Mexican, Chinese and BBQ are among the wide variety of foods to choose from. Thursday 7/18: 5:00p.m. - 11:00p.m. Sunday 7/21 12:00p.m. - 10:30p.m. 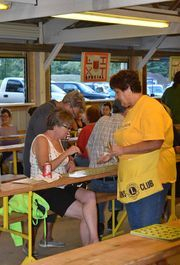 Bingo games are played nightly throughout the festival under the Lions pavilion. Thursday (7/18): 6:00p.m. - 10:00p.m. Friday (7/19): 6:00p.m. - 10:00p.m. Saturday (7/20): 2:00p.m. - 4:00p.m. Sunday (7/21): 2:00p.m. - 4:00p.m. - NO ONE UNDER THE AGE OF 18 WILL BE ALLOWED TO SIT AT THE BINGO TABLES WHILE BINGO GAMES ARE IN SESSION. CHILDREN ARE NOT ALLOWED TO TOUCH THE BINGO CARDS. Parking is available on either the north end of the park (3rd Street entrance), the south end of the park (1st Street entrance) or the east side of the park (Center Street temporary entrance). Handicap parking is available on a first come, first serve basis next to the Lions bingo pavilion. Handicap permits or license plates are required to park in a handicap zone. There is also handicap parking available near the flea market on a first come, first serve basis. All events, activities, performances and entertainment are held in an outdoor setting and are subject to the weather elements. Events & activities are subject to change or cancellation with little or no advanced notice due to the weather. Vendors are responsible for providing their own shelters, canopies, tents or awnings. Carnival rides may be shut down at the discretion of A&A Attractions management and operators due to hazardous weather conditions and/or safety concerns. 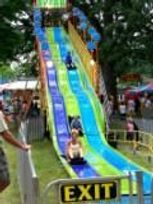 No refunds will be given for carnival ride tickets or wristbands due to cancellations caused by hazardous weather and/or safety concerns. Live photography and video/audio taping will be taking place throughout the festival grounds each day. Your presence on festival grounds and/or participation in any festival activity, event or tournament shall serve as consent to photograph and/or video/audio recording.